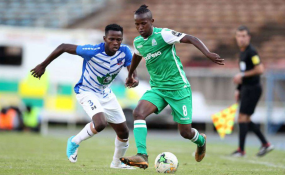 Gor Mahia midfielder Francis Kahata (right) shields the ball from Chidiedube Duru of Lobi Stars during a Caf Africa Champions League match in Nairobi on December 16, 2018. Gor Mahia coach Hassan Oktay has tabled a request to the club management to sign three players in the midseason transfer window. A striker, a winger player and one defensive midfielder is all the Turkish-Cypriot coach wants as Gor prepare for the Caf Confederation Cup quarters as well as the domestic cup and SportPesa Premier League (SPL) title defence. "If they don't get (the players) for me, I have enough quality that I can work with, I've got no issues," the 42-year-old said. "But I can't reveal the names of who we want at this moment." K'Ogalo are reportedly interested in the services of Tusker's Ugandan combative midfielder Hashim Sempala whose contract with the brewers elapses in June. Oktay admits he has been losing key players to injury due to fixture congestion both on the domestic and continental front. "When you play in the league and the Confederation Cup that involves travelling back and forth, sometimes you lose concentration because the boys are tired but my job is to sort all these issues," he noted. Gor launch their campaign in the SportPesa Shield with a round of 32 match against regional side Kenpoly on Wednesday at the Moi International Sports Centre, Kasarani from 3pm. Gor have not won the cup since 2012. They bowed out at the quarterfinal stage after falling to eventual winners Kariobangi Sharks last year.